Villainous Company Event home HamiltonThe PromNetworkTo Kill a MockingbirdKiss Me KateHadestownOklahoma! 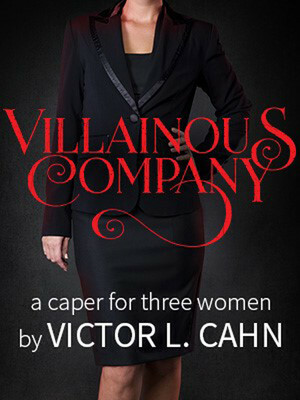 Join playwright Victor L. Kahn And director Eric Parness for the Off-Broadway world premiere of Villainous Company, coming to New York City's Clurman Theatre, January 9th -31st 2015. Prolific writer Kahn has produced many Off-Broadway and regional productions, also treading the boards himself in performances of Shakespeare, Pinter and Shaw. His gift for understanding character motivation gives his plays an exciting believability. An exhilarating tale of cat and mouse, Villainous Company chronicles the chance meeting of three women after Claire returns from a shopping expedition only to find one of her packages is missing. Theft, lies and suspense is the name of the game in this fast-paced thriller. Sound good to you? Share this page on social media and let your friends know about Villainous Company at Clurman Theatre. Please note: The term Clurman Theatre and/or Villainous Company as well as all associated graphics, logos, and/or other trademarks, tradenames or copyrights are the property of the Clurman Theatre and/or Villainous Company and are used herein for factual descriptive purposes only. We are in no way associated with or authorized by the Clurman Theatre and/or Villainous Company and neither that entity nor any of its affiliates have licensed or endorsed us to sell tickets, goods and or services in conjunction with their events.